Quinoa is having quite the moment in the super grain spotlight, and it’s not hard for me to see why. I have dabbled in all sorts of adventures involving this complete protein. 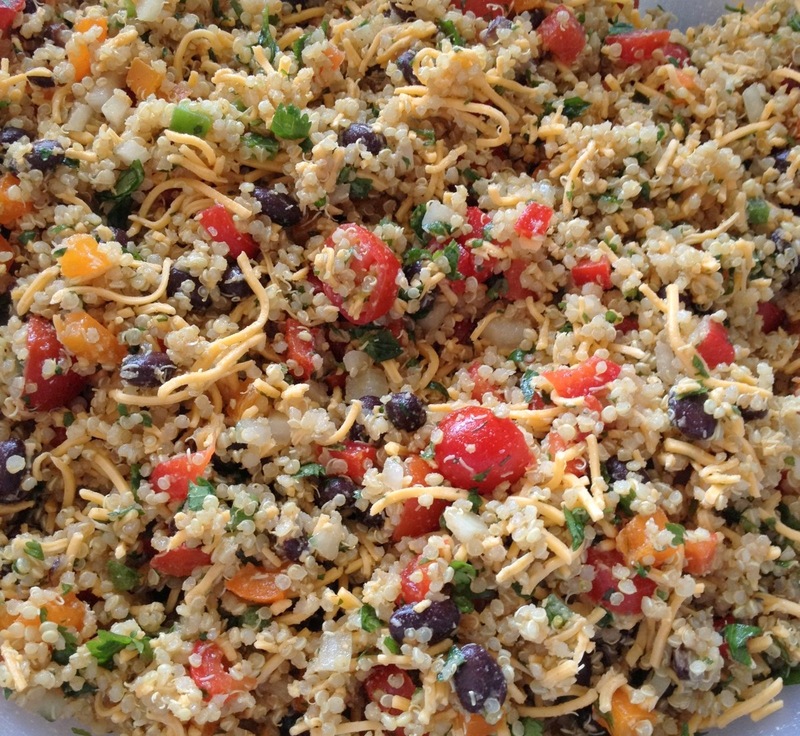 Quinoa casseroles, quinoa burgers, quinoa salads, and quinoa fritters to name a few. For people like me (90% vegetarian) what? I still like bacon, OK. Don’t judge. Quinoa practically came down from the heavens in a glowing orb of light. One of the few grains that essentially is a grain with the genetic blueprint of meat, because it’s loaded with all the amino acids, and is chock full of protein. I think its real shining talent though, is that it is mild tasting and easily adaptable. This salad was just slightly adapted from This one I found on where else, but the mecca that is Pinterest. In her recipe she uses a cup of quinoa, but I use the whole package, because my family will eat it throughout the week. It is so delicious, you’ll kick yourself if you don’t make enough for leftovers. I use a 12 ounce package of organic pre-rinsed quinoa, cooked following package directions. I use a large bunch of cilantro, half of a sweet onion in place of red, I add a cup or so of grated cheese, a whole pint of cherry tomatoes, two red/yellow bell peppers, and two chopped jalapenos. For the larger salad I think about 1/4 cup light EVOO, emulsified with the juice of two limes and a tablespoon of sugar works nicely. I add cumin, onion powder, garlic powder, and S&P directly to the salad instead of the dressing because it can get a little grainy and thick. I never measure, but lets just say I am generous with my spices. If your comfort level in the kitchen isn’t so daring, add a little at a time, tasting as you go. I have also added corn and freshly grated lime zest to this salad with wonderful results. The brightness of the limes transforms this salad. The balance of acidity and sweetness is delightful, so don’t be put off about adding the sugar. So that’s it, you pile all of your ingredients into a bowl, and toss with your dressing. I will advise you that this meal is best when washed down with a crisp Sanpellegrino grapefruit soda. Scoop a heap of this onto a tortilla chip, and say hello to your new favorite summer salad.